I am so excited to share this recipe!!! 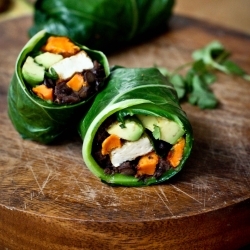 Everyone will love these wraps! Even your meat eaters will surprise themselves and ask for more. These little wraps are full of texture and flavor in a surprisingly blend that will tickle your taste buds. They are gluten and dairy free and chock full of nutrients. The walnuts, when pulsed, have the texture of meat. All you will need is a food processor. A really good blender can do the trick as well. Pulse the walnuts and spices about 3-4 times. Then add onions and Braggs and pulse 4-5 times. It’s very important to not over pulse. You don’t want to make a spread but keep the nuts chunky. To make the wrap; Take a whole collard green leaf with the tough stem cut off. Lay it down length wise. Spoon 1/2 of the nut mixture on one side of the stem running through the center the leaf. Add a couple slices of mango, avocado, and bell pepper, 1 T. tomato and about 1 T. chopped cilantro. Squeeze a little bit of lime on top then get ready to roll into your wrap. Roll the long end of the leaf completely over the mixture 1 time + and then fold both outside ends in and continue to roll the long end until it is compleley rolled up. Cut the wrap in half and enjoy!! !